It would be nice to have one client on retainer that can pay all the bills at the end of the month forever. And then when you decide to grow your law firm, your client would willingly increase the amount they pay you on retainer without you having to ask. Sadly, the world does not work like that. So if you want your law firm to grow and ultimately make more money, then you need to market your services to attract new clients. The question remains, at what tipping point should you go out and hire a web marketing agency? Luckily for you, we have the answers. Marketing does not have to be expensive, but it does require a good amount of time set aside to plan, implement, analyze, and iterate marketing campaigns. There are so many facets of marketing from content marketing, social media marketing, paid advertising, search engine optimization, etc. You don’t have to commit to all of them, but you do have to understand what they are and how your law firm can or cannot benefit from those marketing verticals. As a service provider, your commitment should be focused on doing the “Real Work”. That means assisting your clients to your fullest extent and over delivering. After all, we did mention that referrals from excellent work with existing clients is the most effective way to obtain new clients in our previous article about finding new prospective law clients. However, in terms of inbound marketing, you don’t want to stop doing the “Real Work” to market your business. After all, that’s not what you went to law school for. Instead of hiring an in-house marketing employee, why not hire an entire team of marketers at a web marketing agency? 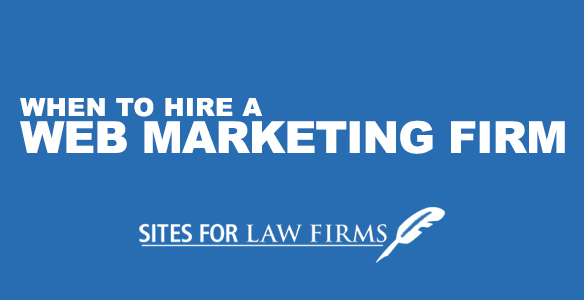 With law firm marketing agencies, you will have an entire team at your fingertips instead of one person that is solid all-around. Most web marketing agencies hire talented individuals that are experts in their craft. For example, a standard web marketing agency will have an expert social media strategist, web developer, content strategist, SEO strategist, marketing director, email campaign manager, and more. Not to mention, It makes financial sense. You pay no payroll taxes or benefits with an agency, they use their own hardware, software, and require no office space. And if you decide that you no longer want their services, you can cancel their services without having to worry about pending lawsuits for wrongful termination. SEO, SEM, inbound marketing, content marketing, content management systems, email service providers, etc. Marketing can be daunting, and to some, is a whole new language. Not all marketing is necessary. However, without a trained eye, they may appear to be important and something you should be doing. The truth is, some marketing tactics can adversely affect your company. Instead of learning and filtering through all the noise and updates by the search marketing world, marketing experts that follow the industry can immediately decipher what will work and what does not for your company. For example, SEO (search engine optimization) and SEM (search engine marketing) look very similar, but are very different. One requires paid advertising and the other requires onsite & offsite page optimizations. Both very important, yet both requiring completely different types of marketing techniques and strategy. If your team is lacking those skillsets and don’t know where to start, an agency can cover your needs. Finding your law firm in Google after typing in its exact name is extremely easy. For example, if your business law firm in Dallas, Texas was called “The Law Offices of Michael J. Scott” then when you type in that exact phrase “The Law Offices of Micahel J. Scott” into Google, chances are you will show up in the search results. Maybe even first. However, what if you type in “Business Attorney” while conducting the search in Dallas, Texas? If you can find yourself immediately, there’s a good chance other people will also. What if you can’t find yourself immediately, and even worse, happen to see all of your competitors in places where you should be. If that’s the case, that’s exactly what attorney-seeking clients see. Most prospective clients don’t exactly know what they are looking for. Most prospective clients would not know your firm’s name even if you were the best law firm for their needs. However, that will not stop them from searching. Their search for the right lawyer refines as they consume more information. Prospective clients will know that they need a lawyer in a specific niche. Therefore, they will attempt to find an attorney or law firm they need using general niche-related keywords and phrases like “Business Attorney” or “Pregnancy Discrimination Attorney”. If you don’t show up for your niches general keywords , then you’ll need a web marketing firm that can put you on the map quickly. Always remember: for every potential client you don’t capture in your area of practice and geographical location, you lose out on strengthening your portfolio, or even worse, you lose out to your competitors while they strengthen theirs.